This is also known as the French style. Although precise technique is required to press down on the finger holes, it is also possible to utilize certain special techniques such as making variations in the sound produced by shifting the fingers ever so slightly. This is also known as the German style. The G key is easy to reach and this style is also suitable for players with small hands. This is the type with the main keys positioned in a straight line. Itis not possible to use the E-mechanism on this type. Since the G key which is operated with the ring finger of the left hand is protruding, the finger can be positioned naturally, allowing for a reduced amount of burden on the wrist during a performance. The tone holes are soldered. The cups which are attached separately are soldered one by one onto the tube to the precision of a micro unit. This method allows for consistency in the thickness of the tube and offers a superior sensitivity and durability in addition to a more solid thick sound. The tone holes are drawn and rolled. The work of drawing the material from the tube to make the holes and rolling the rim is done by skillful craftsmen. Because the structure is integrated into the body, there is no need to be concerned with the deterioration of connected pieces, and the sound is light and legato is easily produced. The flute is an instrument which also holds value as a work of art. 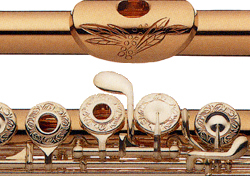 SANKYO offers beautiful engravings on the body of the instrument as an opiton. 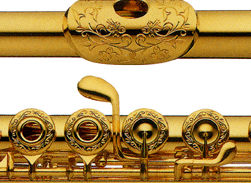 By personalizing your flute with the hand-carved designs of proficient craftsmen you will certainly feel an ever deeper attachment to your instrument. At SANKYO FLUTES, we have succeeded in using a machine to recreate the aesthetic properties of engravings created in the hands of craftsmen. It is also possible for you to have your own personal design engraved onto your instrument. Please place your order. The NEL is intended to facilitate high E without the conventional "split E" Mechanism that closes the G# key while leaving G open. An insert makes the opening of the G hole smaller. This also makes the G-A trill easier. This option is now standard on all SANKYO models. This option makes the playing of the third octave E very easy (played by a special rocker key on the right hand). This option is now standard on all SANKYO models. This extra key enables the player to trill from B to C# (a problem in the Mozart D major Concerto as well as in several other pieces).Available on the Hand-made DN and Hand-made SR models.